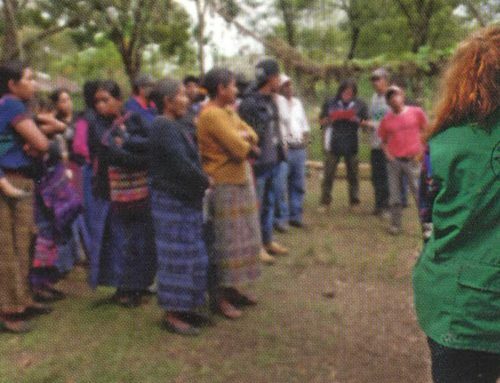 Accompanier Claire Bransky dedicates this article to Claudia Patricia Gómez González and the many other victims of the United States’ imperialism and racialized violence. The US’s funding and training of genocidal dictators and its imposition of mega-projects on indigenous and campesino lands have created conditions that have forced many from their homes; these same migrants then face state violence and private profiteering at the border. We call for justice for the many families hurt by US state violence and for respect for community self-determination. Content note: This article includes information about racism, violence committed by government agents, and systemic violence like poverty and forced resource extraction. On May 23, 2018, Claudia Patricia Gómez González made her way through an unfamiliar city with three other refugee immigrants. As they passed through the streets of Laredo, Texas, they probably gazed at the signs, the trees, the cars, and perhaps they breathed a sigh of relief. They had finally arrived. Perhaps Claudia and her companions compared the blinking commercial areas to the poverty that they had just escaped. Perhaps Claudia thought of the bills waiting for her at home, bills from her degree as a forensic accountant that were holding her back from her dream of studying more. Perhaps Claudia was scared. Perhaps she was glad. Perhaps she was just exhausted. We’ll never know how Claudia felt that day, because on May 23, 2018 a US Border Patrol agent shot her in the head, killing her instantly. There is very little information about what happened in the moments leading up to and after Claudia’s murder, a dark hole in our collective memory that casts even more shadows behind other swirling unknowns; are children really being taking from their parents at the border? The Trump administration is hoping to start housing migrant children in military bases? Why is ICE seeking to destroy records of immigrant abuse? (Answers: Yes, 700 since October;* Yes,likely in Arkansas and Texas; Public transparency is never helpful for government forces that rule through fear). A border patrol agent pouring out water left by volunteers for immigrants crossing the desert. Source: “Volunteer Arrested Hours After Exposing Border Patrol’s Destruction Of Water Bottles Meant For Migrants,” Digg.com. Claudia came from San Juan Ostuncalco in Quetzaltenango, Guatemala. She was Mam, one of the largest indigenous Mayan ethnic groups. For hundreds of thousands of years, the Mam people have cultivated corn, the center of their daily and spiritual life. Every family has their milpa, small plots of land where corn sprouts, strengthens, and dries tall every year. Quetzaltenango is chilly, and the highland winds keep folks there wrapped tight in bright sweaters that make dots of color in the mountainside when you see them working from afar. After harvest, the corn dries on the cobs, and the kernels are kept in big barrels to stay dry through the year. Every day the women in each family take a little corn out, clean it, cook it, and carry it to the local mill. They sway back home, ground corn dough balanced elegantly on their heads. In the warmth of the kitchen, the corn is transformed into anything a person could need. Tortillas and tamales fill the stomach while atol, a warm drink made from corn, calms the soul after a long day at work. There’s usually a little broth or a tomato salsa to eat with the tortillas, but the corn is what keeps you warm and awake. When the harvest is good, people eat; when the harvest is bad, the wind slaps into hollow bodies, tense hungry faces. In the US, you can generally find a job that will pay you something; if its minimum wage it will never be enough to support you, but you will at least have a little cash. I want you to try to imagine an economy where there are no options, even for a badly-paid, part-time job. No matter where you go with your qualifications, work ethic, and motivation, nobody is hiring. And there are a thousand other people like you looking for the same nonexistent job. So, you turn to informal economy, just like 70% of Guatemala’s workforce. Maybe you sell bug swatters at a busy traffic light. Maybe you make $5 a day. Maybe you make $5 a day, and maybe you can’t afford the hernia surgery that you need, and maybe your kids’ shoes are falling to pieces, and maybe your roof is leaking because it’s a piece of metal from 1996, but generally you’re okay. You have what you need to survive. For breakfast there is a hot cup of atol, for lunch steaming tortillas, and at dinner a little broth made from the beans that you grow between the corn. You and your family can eat, and the warmth of the stove fills your laughter as you talk late into the night. On Sunday you go with your sisters to the mountain, where you pray, making offerings to the Earth, knowing that she will continue to feed you, to hold you, no matter where the gangs are or how much the coyote wants for smuggling your cousin up north, or how many days your deputies in Congress spend at a luxury resort instead of funding your local school. And then the mine, arrives, and the Earth no longer holds you. Your corn isn’t growing well, and the stream that you use for irrigation, water, and bathing gives your children angry red rashes that make them whimper at night. Your wife has a cough that sounds too deep to be real. You have nothing, and some man told your oldest daughter yesterday that if you don’t pay your cousin’s coyote soon, there would be problems for her and all of you. She is 11 and terrified. So when the gentleman in a suit arrives and offers to buy your land for $1000, you barely think before signing the papers. After all, that’s about the cash that you would earn in two years. A woman looking over the Marlin Mine in San Marcos, Guatemala. 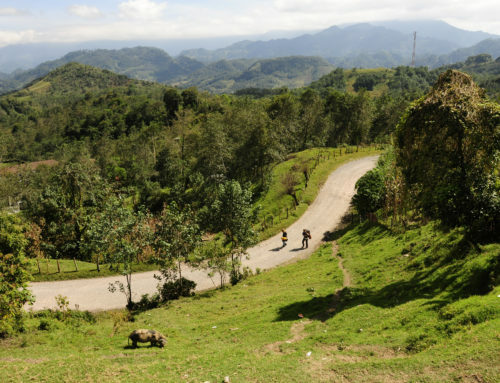 Source: Susan Kemp, “One Man’s Fight for Guatemala’s Natural Rights,” Salt. For a couple months, everything is good. The coyote is paid off, and your daughters are back at school in new shoes. You still can’t get the hernia surgery, but some new pain pills go a long way. Unfortunately, pills aren’t enough for your wife’s cough. With the money from the mine you can buy dried corn now, which doesn’t taste the same, but you’re able to afford meat to go with it, so nobody complains. The stream that you once used has become the local dump, filled with the bright plastic candy wrappers that people can now afford with their mining money. The mine had promised a water sanitation project when your neighbor made a fuss about it contaminating the stream, but it seems that somebody forgot about that. Anyways, you have to buy water now, too. Costs are building up so quickly that one day you realize that you’ve used almost all the money. You call your sister to go to the mountain, to pray for something, anything, and she tells you the sacred land was just sold by the mayor. “The mine is expanding,” she tells you. A baby with sores from contaminated water near the Marlin Mine in San Marcos, Guatemala. Source: Bill Law, “Canadian mine accused of causing skin infections,” BBC News. And so, like millions of others, like nearly half of Mam people in Guatemala, like the very same nickel or gold or silver mined from your ground, you run to the north. Perhaps, like my friends and coworkers in the Driftless region of Wisconsin, you work on a farm and grow food for people in the city, many of whom support deporting you. Maybe, like the 7,000 people whose remains have been found over the past two decades, you disappear at the border, lost to athirst that cannot be imagined. Maybe your mother is still looking for your body, right alongside the mothers of the more than 45,000 people who were forcibly disappeared in the internal armed conflict forty years ago. Different wars, same causes. Maybe you’re like my friend Roberto**, who is also Mam, and made his way up to Michigan where he worked for 5 years. In 2003, trying to escape from a job at a slaughterhouse that was “extremely exploitative,” Roberto decided to make his way down to Miami. As he got off the bus, immigration officers asked for his papers. A few days later he was deported. Roberto’s story always stays with me because when he returned home he used what money he had saved to study, and educated himself about the history of Guatemala. Through his studies he learned – for the first time – about the United Fruit Company, the CIA-orchestrated coup, the internal armed conflict, the genocide, the disappearances, and the continued forced extraction of Guatemala’s wealth. Education gave him an opportunity to understand the causes of the poverty that drove him from his home and loved ones, that forced him to exploit himself in the blood of packing corporate meat, that put him through the indignity of being forcefully removed from a country to which he had given his heart and hands. 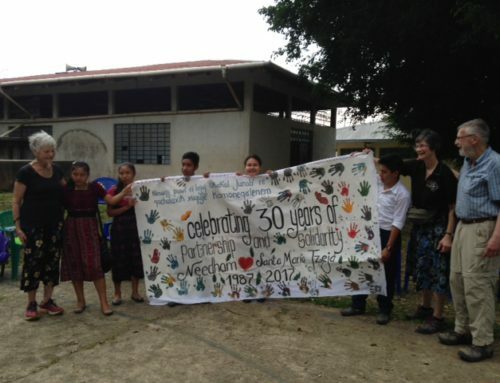 Roberto is now a teacher, along with his wife and two sister in-laws. His curriculum is very controlled by the government, but he manages to still teach his students the truth of the Spanish Invasion and the ongoing colonization of Guatemala. When inspectors come he just makes up a different class plan on the spot. Unlike far too many people who are forcefully removed from the US, Roberto’sstory has a happy ending; he lives with his wife and two children in his beloved hometown, about three miles from Claudia’s hometown of San Juan. His oldest daughter is already head of her class. The entire family gets together on the weekend, over twenty people laughing, drinking, and eating without having to worry or skimp. They are joyful to be together, but there are big holes where their other loved ones should be. Roberto’s niece, Rosa**, my best friend, hasn’t seen her husband in five years. He has only ever met their son, Davíd**, through video chats online. Rosa can understand how her son feels when he asks when papa is coming home; her mother left for the US when she was 3. They have not seen each other in 20 years. 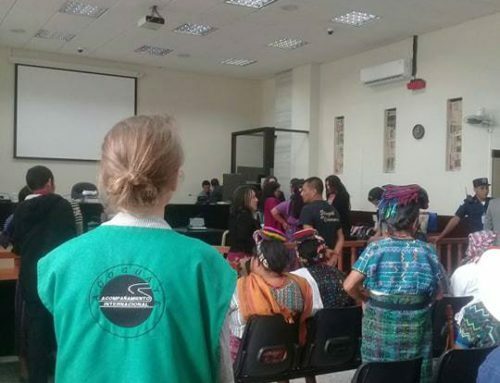 According to the Guardian, “In 2017, 65,871 Guatemalans were apprehended at the southern US border.” A crisis of this size does not start in Guatemala; it starts in the government and corporate offices of the US, where powerful people plan to control foreign politicians, force in mega-projects like dams and mines, and then – so conveniently! – capitalize off of the detainment and detention of the same people running away from the destruction. Trump had escalated the violence not only within the US, but also by, for example, supporting the stolen election in Honduras at the end of 2017, which exemplifies the exact kind of state violence and corruption that immigrants are escaping. That said, let’s not forget that the Obama administration deported 2.5 million human beings, supported the 2009 coup that led to November’s violence in Honduras, and was the intellectual author of the Alliance for Prosperity. While the Alliance for Prosperity claims to be in response to the 2014 crisis of unaccompanied minors crossing the border, it just continues to feed the machines that caused the immigrant/refugee crisis in the first place. 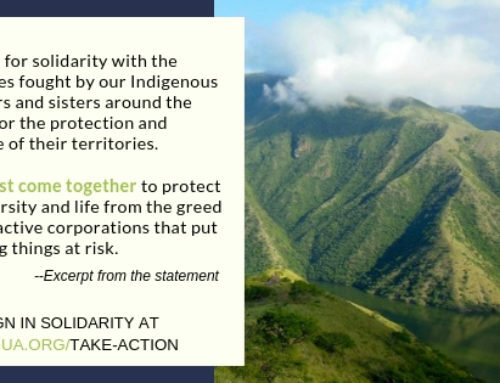 Despite the known corruption of the partner governments in Guatemala, Honduras, and El Salvador, the Alliance for Prosperity opens up Central America to even more international resource extraction and increases militarization of the Northern Triangle. A man protesting in Honduras after Juan Orlando Hernández fraudulently won the presidential election in November 2017. Despite international condemnation, the US certified the results, which allowed military aid to continue flowing to the Honduran government. That money consequently funded the killings of dozens of people while they protested the robbed election. Source: School of the Americas Watch Facebook page, January 27. There is real and serious work to do to support immigrants in the US right now, and not just immigrants from Guatemala. Folks from all of Latin America, the Middle East, Africa, and Asia are arriving at our borders as a tangible consequence of the wars that we have waged, loudly and quietly, openly and secretly, through the entire Global South. And as we work with our immigrant comrades to make a country that is safer and more just for all of us, may we remember that the work is international, also. That is, to support immigrants means to also create a world where they don’t have to leave; where a young forensic accountant can stay and learn all she wants; where a stream is filled with laughing children, not the toxic run-off of a mine; where a school teacher can calmly teach his students the truth, in peace. There are so many people already creating this world; we just have to join them. If you feel inspired to do more after reading Claire’s article, please take action today to support community self-determination. Demand Guatemalan Congress respect existing community consultation votes by joining our postcard action at nisgua.org/take-action. Organize your community to join you – ask friends to sign copies of the postcard and share the link to the action on social media to get more people involved. 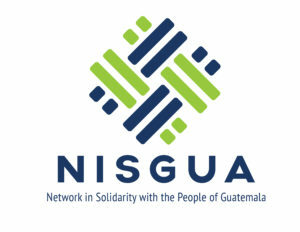 Donate to NISGUA and support our organizing with groups fighting to defend their community consultations. You can read more about Claire’s experience as an accompanier on her blog. * Since the writing of this article, the situation has turned out to be even more dire, with the number of children separated from their parents between October 1, 2017 and May 31, 2018 estimated at around 2,700. ** Names changed for security purposes.